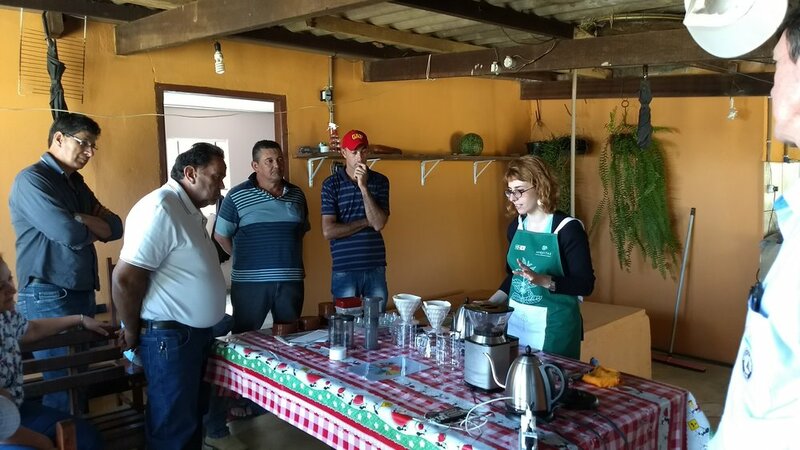 As part of Aequitas’ initiative of approaching farmers to the market, during one week in August, a series of lectures and coffee brewing workshops was held for 4 distinct groups of coffee producers in the region of São Gotardo. During three and half hours, a brief outlook about the US market was presented – as result of my research field trip to the US in April for SCA coffee expo and impressions from the specialty coffee scene around Seattle, Portland, Bend, and San Francisco. Afterwards, throughout 3 hours Maria Antonia Mion, barista and partner at Supernova Coffee Roasters located in Curitiba – 1.100 km from São Gotardo – presented filtered coffee brewing techniques, perceptions about Curitiba’s specialty coffee consumers and her everyday experience behind the counter making lots of espressos, macchiatos, cappuccinos and drip coffee to Supernova clients. 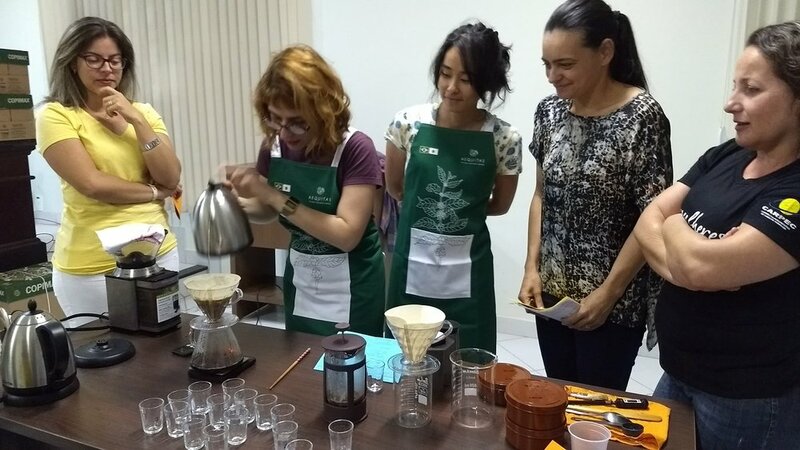 Maria’s workshop is quite interesting, she teaches not only about extraction techniques but also curiosities and the history of each method. She divides the methods in timelines: classic, modern, and post-modern and focused on teaching the most popular methods in specialty cafés. At this edition, she taught in minute-details the importance of coffee and water qualities, storage, different coffee infusions and extractions due to different types of grinding and lastly a step by step for making a delicious coffee with a French press, Hario V60 and Aeropress. We used the producers’ coffee from the 2017 harvest. 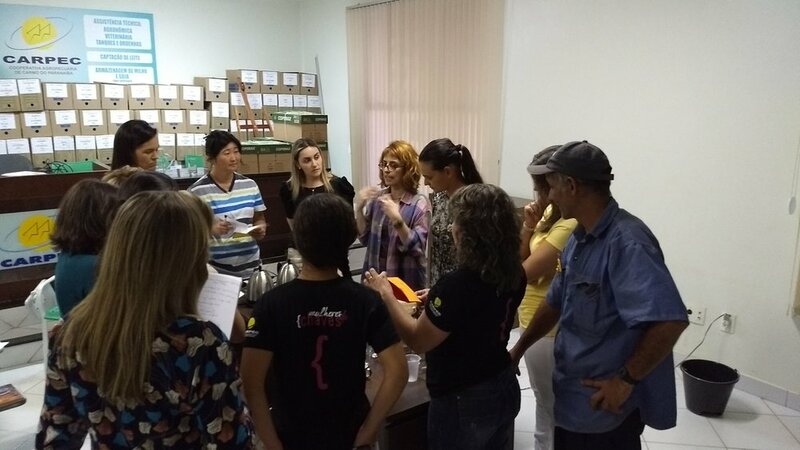 The workshop got more stimulating for everyone, especially the sensorial perceptions in body, sweetness and acidity when tasting the same coffee in different methods. At Coopacer, a co-op located in São Gotardo, the first group had producers, agronomists, co-op employees and local roasters participating. They were quite curious and lots of questions arose about the specialty coffee market. The second group were formed by small producers, from 2,5 to 30 hectares, who are assisted by EMATER (Minas Gerais State Company for Rural Technical Assistance and Extension) and the activities happened at Mr. Rafael’s house in Agrovila – thanks a lot Mr. Rafael for your hospitality! They were quite curious about Maria’s teachings and it’s interesting noticing that each audience has different doubts, behavior and needs, even though dealing with the same thing that is coffee. This is the beauty of human nature. The third class was at Coopadap where most of the participants were coffee producers. The class were quite advanced about concepts of specialty market and delighted themselves at the workshop. At last, the 4th group was my darling one. I was there not just representing Aequitas but it was my contribution to IWCA, as an IWCA Cerrado Mineiro member and advocate for women empowerment, especially in the coffee chain. The women producers belong to the rural community of Chaves and to the co-op Carpec in Carmo do Paranaíba, 50 km from São Gotardo. Maria and I were quite surprised and pleased for seeing Maisa, a curious 16-year-old girl who were attending the workshop among adults. Her mother couldn’t participate so she was there to represent her. This is such a significant participation that express the importance of family succession in farming, whereas sometimes we see the younger generations that don’t want to continue in rural activity. At the end, after an intense week sharing and learning through talks, workshops and visits to farms, the feeling was of fulfillment for the opportunity of impacting 40 people’s lives and a reinforcement to myself: I simply enjoy establishing connections with people and even more when those new links are created through coffee. Brewing workshop at Mr. Rafael's (second on the right) in Agrovila.